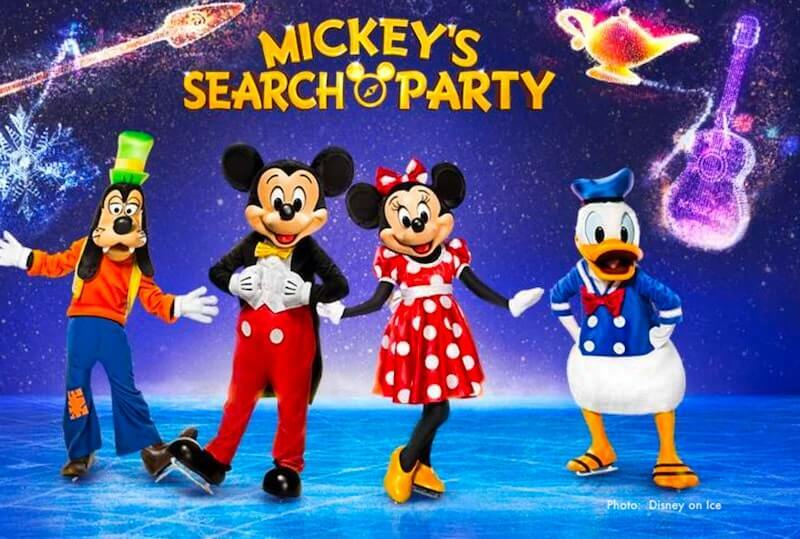 Disney on Ice brings "100 Years of Magic" to the Agganis Theater for its special holiday show in December, and then returns for the Winter School Vacation Break Week during February with their all-new "Mickey's Search Party" show. Disney on Ice arrives Boston every winter as a top family fun event and usually presents two different shows - one in December-January, and the other in February. With talented performers in costumes portraying all your favorite Disney characters, this fabulous ice show never fails to dazzle with its perfectly balanced mix of dance, unforgettable music, and exciting moments. 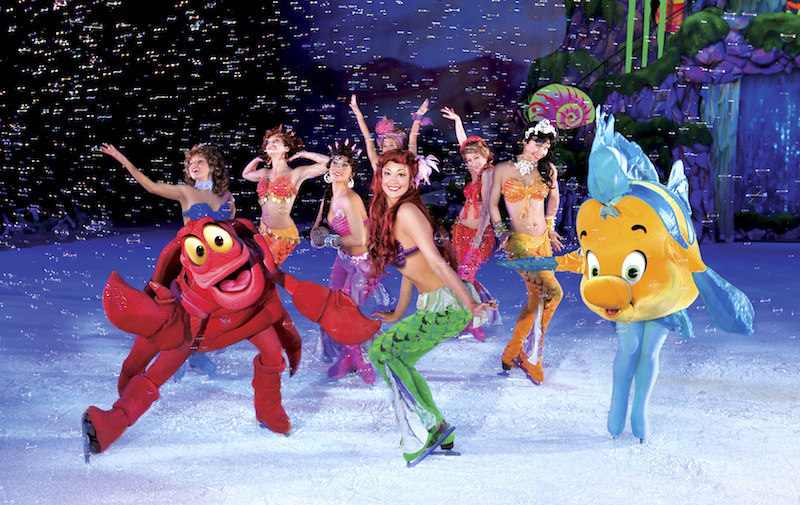 The Disney shows take place at Agganis Arena or TD Garden, Boston's two premier ice rinks. Both venues are super-convenient to reach by subway and car. Get ready for a magical journey with Disney on Ice! Disney on Ice's brand-new Mickey's Search Party show will dazzle you as its cast of over 50 world-class performers performs exciting acrobatics, expert skating, and fantastic stunts on the ice and in the air. You'll see a search with Captain Hook's treasure map through Tinker Bell's fantasy worlds, an exploration of the spiritual world of Coco, a sailing adventure with Moana as she saves her island, and Belle come to life in the sky above you. You'll relive exciting moments from Aladdin, Toy Story, and The Little Mermaid, and sing along with Elsa in her magical world in Frozen. The area around the Garden is also home to many of the city's top sports bars - perfect for lunch or dinner before or after Disney on Ice. If you're visiting TD Garden with kids, take them to visit the Sports Museum in the Garden - lots of fun to see the history of Boston's many winning sports teams! Check the Sports Museum website before you go to make sure they're open, because they close on holidays and during certain Garden events. Agganis Arena is located on the western end of Boston University's campus. 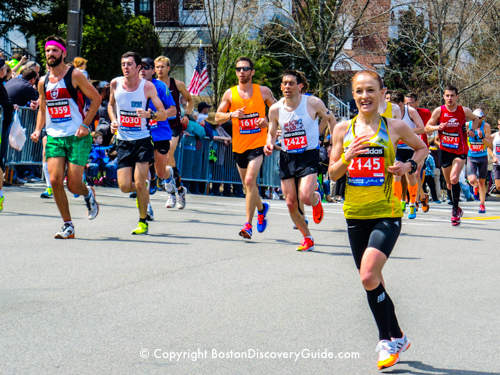 If you want to see other Boston attractions before or after your show, getting to them is easy. The subway's Green Line/B Branch runs down the center of Commonwealth Avenue, so you can board it right in front of the Arena at the BU West stop and be at Fenway Park in less than five minutes, in Copley Square in 7-8 minutes, and on Boston Common in 10-12 minutes. Or you can easily walk to all of these locations - from Agganis Arena to Boston Common is about a mile. Depending on how fast you walk, getting there on foot may be even faster than taking the T (subway). Because Boston is so compact, you can stay anywhere in the city and still not be far away. 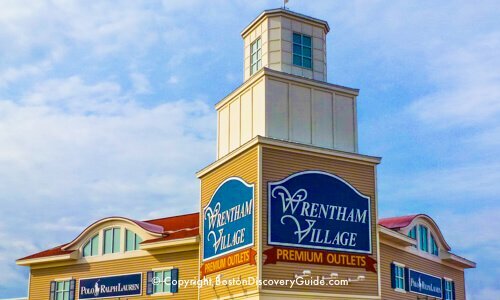 Use our Boston Hotel Guide to find recommendations by location, as well as bargain hotels, luxury hotels, etc. To get to Agganis Arena from these hotels, just hop on the "B" branch of the subway's Green Line. If you want to grab a bite to eat (burgers, burritos, pizza) before or after the show, you'll find plenty of affordable casual choices along Comm Ave near the Arena, particular on the block to the west (away from downtown). Disney On Ice takes place at Agganis Arena during the height of Boston's holiday season - so check out all the Christmas festivities in Boston. Staying in Boston through New Year's Eve? Find out about New Year's Eve events in Boston. Get ready to fall in love all over again as a cast of over 50 performers dazzle you with Mickey, Minnie, Donald Duck, Snow White, Rapunzel, Cinderella, Frozen's Anna, Elsa, and Olaf, and all your other Disney friends. You'll relive exciting moments from Finding Nemo, The Lion King, and Beauty in the Beast, and sing along to over 30 memorable songs. 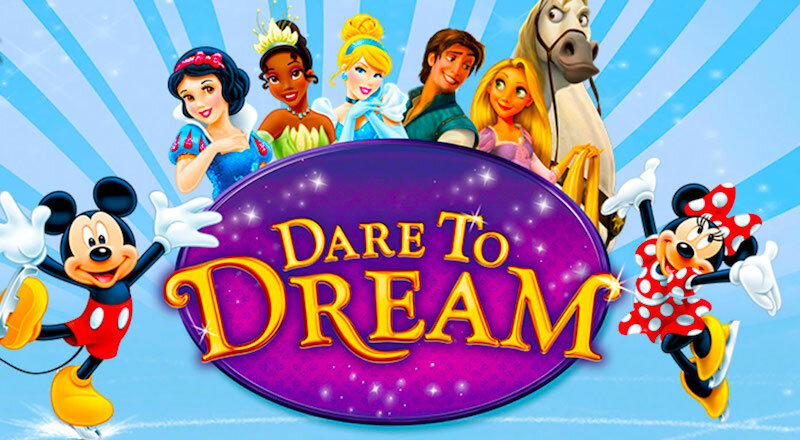 You'll feel inspired to Dare to Dream when Mickie Mouse and Minnie Mouse share the exciting stories of five courageous Disney princesses, enacted by the dazzling performers skating across the ice. You'll thrill with the adventures of Rapunzel, Belle, Cinderella, Moana, and Anna and Elsa, plus all of their animal friends, Fairy Godmothers, and even the seven dwarfs. Your whole family will laugh at the enchanting stories from Tangled, Beauty and the Beast, Cinderella, Moana and Frozen. You'll love Follow Your Heart, an incredible undersea adventure starring your favorite forgetful fish, Dory, along with best friends Nemo, Marlin, and new buddy Hank. As the spectacular skating show unfolds, the ice transforms into a colorful deep-sea world of beauty, mystery, and adventure. Follow Your Heart takes every person in the audience on a special voyage of self-discovery while weaving together stories about courage, compassion, and perseverance. 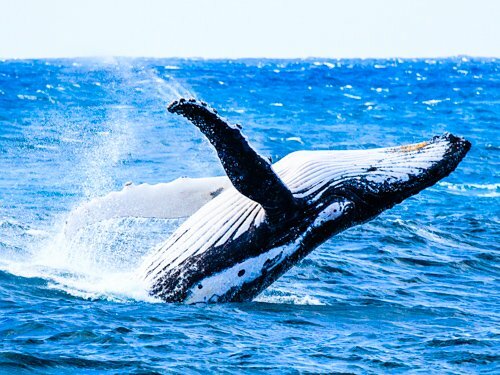 Wonderful show for the whole family to enjoy! Disney on Ice Show in Boston : Dream Big! Adventure and courage entice you to Dream Big as your favorite Disney stories come to life on the ice. As Tinkerbell scatters her enchanted Pixie dust, you'll see Ariel explore life above the waves, discover a new world with courageous Jasmine, and follow Snow White, Aurora, and Tiana as they show you how to always be strong, kind, and fearless. As the talented performers make daring acrobatics, high jumps, and dazzling skating across the ice, you'll feel the excitement of traveling to the worlds of Arendelle, Anna, Elsa and Olaf from Frozen, watch Rapunzel, Cinderella, and Belle learn about the power to make their own magic, and see many more of your favorite Disney characters. Dream Big is a wonderful show your whole family will enjoy and remember!